On Mr. Trask (also, some yarn) | Knit Like You Mean It. Me: I can’t believe this. A whole new era is coming. Me: Can I use that as one of my blog quotes? Mr. Trask: …Well, okay. But you have to include a link. A rare photograph of the elusive Mr. Trask. Note his hand-knit scarf, made from Debbie Bliss Donegal Tweed Chunky. We have other shared obsessions: writing both fiction and non-, reading, hiking. He introduced me to a childhood guilty pleasure, reading comic books, and now we both review graphic novels for Publishers’ Weekly Magazine. Fyberspates Scrumptious DK: From the UK to DC to your home. Mr. Trask recently transitioned from a full-time day job to working part-time (and remotely) in the day job while writing the rest of the time. His first book was published last fall; the next one is due in about six months. He wakes up every morning at 5:45 a.m. to go to our local coffee shop and write. Periodically, I try to do this, and then eventually I collapse of exhaustion, have a great big weeping fit, and he reminds me that I need more sleep than he does. 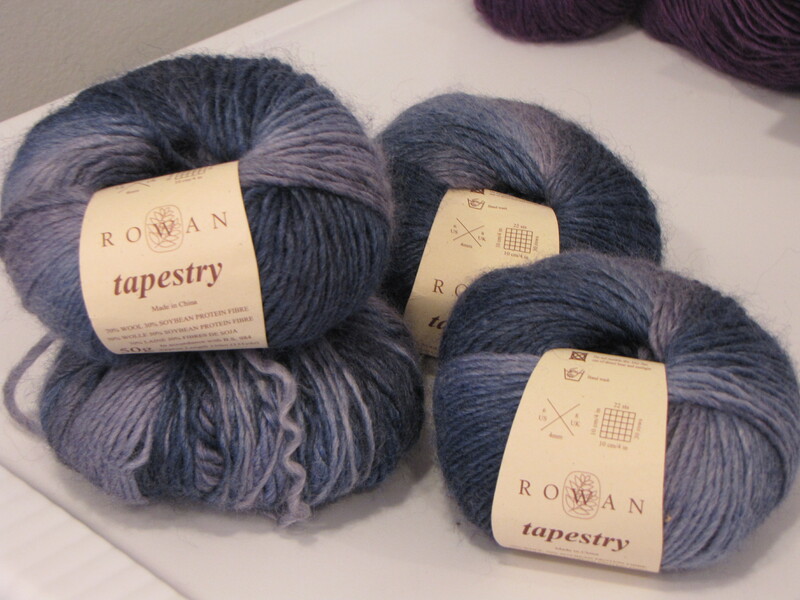 Rowan Tapestry: Who knew that yarn could contain soybean silk? He is 6’5″ tall and therefore has never received a hand-knit sweater, from me or from anyone else. I am waiting until he’s really enthusiastic about receiving such a sweater before casting on – a sweater for a tall man is quite the time-consumer. I’ve knit him several scarves, one of which he wears regularly. Several of the others were repurposed into great swathes of knitting for the Saffron Walden Knitted Maze. Dalegarn Falk: just waiting for your stranded colorwork. When I found out that I had a chance to apply for the program at Oxford, Mr. Trask was even more excited than I was. 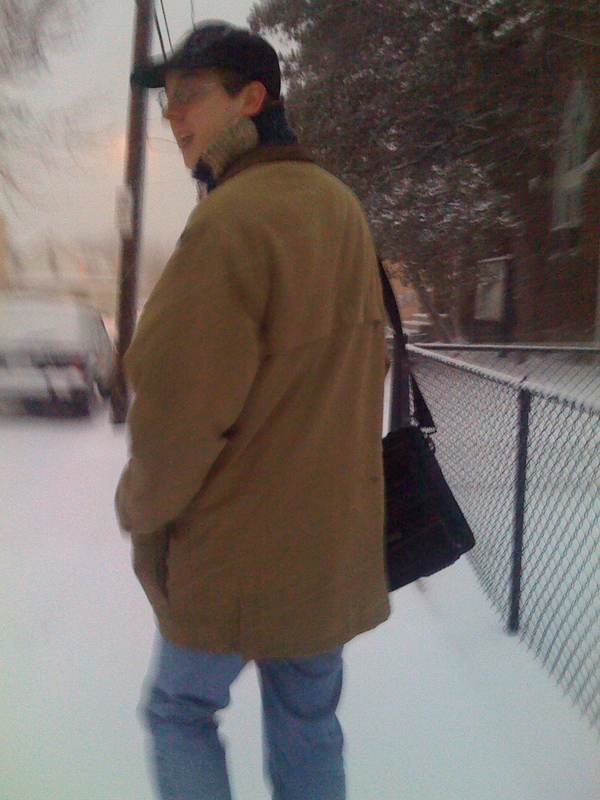 [When he gets excited, he makes sure you know: “Honey, that is GREAT news!”] He also tells people about my program a lot more frequently than I do – I say, “I’m moving to England,” and he says, “We’re going to Oxford because my wife is wicked smart.” [Mr. Trask is from the Boston area. Go Sox!] It’s nice to have a booster. As the time to move gets closer, he is putting up with me saying, “Oh my God! We’re moving to England! Who thought THAT was a good idea?! ?” several times a day. He usually says, “Yes, we are,” and sometimes, “We did.” Very patient man, Mr. Trask. Harrisville Designs Highland Tweed: Delicious and Desirable. Much like Mr. Trask. When I told Mr. Trask I was going to write something about him, he got the same iffy look on his face that he gets when I try to take pictures of him. Then I told him that he could write my blog bio if I wrote this piece about him. He looked even iffier then – another writing assignment? What was I trying to do to him? So – stay tuned for that piece some time later. Two skeins of Fyberspates Scrumptious DK in an amazing purple color. Purchased at the ill-fated UK Knit Camp and brought home in my luggage, this yarn is well-traveled but still beautiful, and can’t wait to make the trip over to your house. Four balls of Rowan Tapestry (70% wool, 30% soybean silk!) that stripes through different shades of blue. One ball was used to knit a gauge swatch (since ripped back); the other three are new, with labels still on. 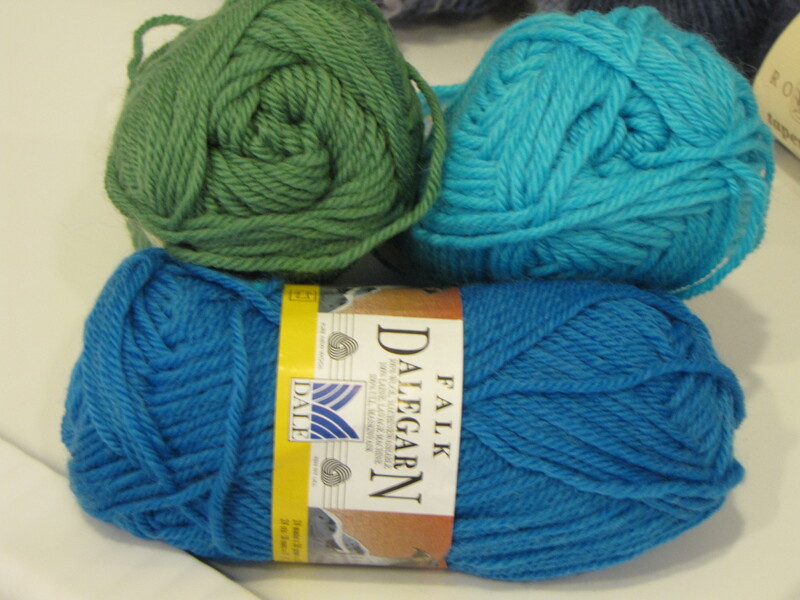 Three balls of Dalegarn Falk – blue, lighter blue, green. Would make a grand fair isle hat. 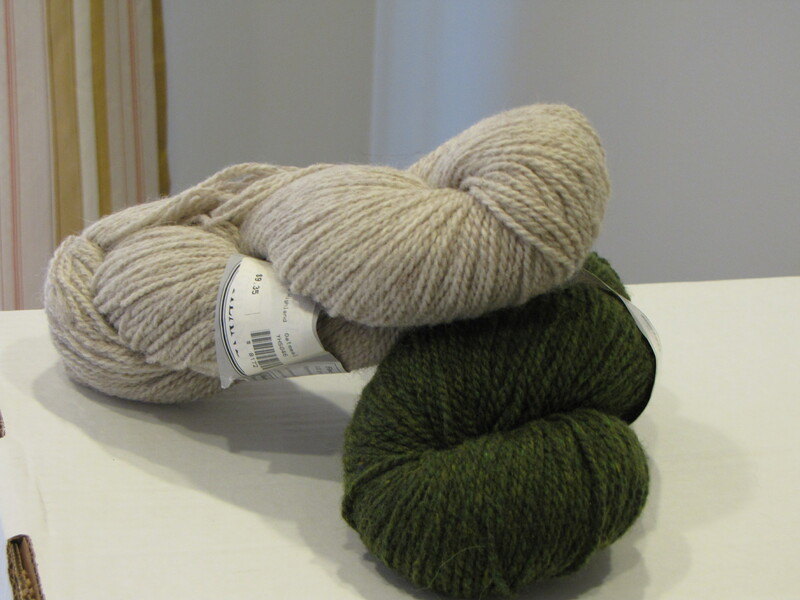 Two skeins of Harrisville Tweed – one in green and one in a lovely oatmeal shade. Delicious, soft tweed. The usual stash giveaway guidelines apply. Comment on this post by Tuesday, Sept. 6, at noon EDT for a chance to win: for whom have you knit the most? Do they wear what you knit? Do you mind, one way or the other? Was this post in any way interesting, or would it be better with some actual knitting content (for goodness’ sake)? Have you ever read a graphic novel? And what’s the oddest DVD in your collection? All winners chosen by my good friend and yours, the Random Number Generator. People, it is stories like these that mean Mr. Trask will just be wearing fleece jackets for the foreseeable future. I knit a sweater for my 6’3″ husband with extra long arms, but I cheated and did it out of big wool. Trouble was, the collar made him look Elizabethan. So I have been saying I would redo the collar for two or three years, and have not gotten round to it. That is the next UFO I am working on, so hopefully he will be able to wear it this winter. Except I think he lost a lot of weight from when I made it for him and now, so it might not even fit. He went from XL to M. Anyway, moral is, you can use big wool to get your man a sweater, but make sure he is going to stay the same size and don’t dilly dally finishing it off. Mr. Trask is not alone. I have an almost knitted Lopi sweater for my 17 year old son but none yet for my husband. Part of the problem is he is in Afghanistan most of the time so I can’t consult him on color or size. Maybe this winter when he returns from parts unknown. My husband is also from MA but I say “wicked” way more than he does. We both root for the Red Sox though. My son, however, is very much into graphic novels and eventually would like to illustrate one. He has taken numerous graphic arts classes and he likes the creative outlet hence my desire to teach him to knit. I am saddened that I will not be joining you in London since my husband’s program is “distance” but I am in agreement that a field study might be deemed necessary! I’ll wait till you get settled and then you can let me know what time of the year might be beneficial (yarn wise, of course). Oh, and the Harrisville Tweed is lovely! For whom have you knit the most? My younger child. Do they wear what you knit? Yes. Sometimes she uses it as floor decor. Do you mind, one way or the other? Nope. Was this post in any way interesting, or would it be better with some actual knitting content (for goodness’ sake)? Yep. Fascinating! You have a great spouse. And what’s the oddest DVD in your collection? I don’t know that any of them are all that odd. My favorite has to be the old VCD of LiangSanBo and ZhuYinTai. lovely post!! he sounds like such a great man..now onto the questions..i knit a lot for my sister..shes not super picky and i can try new patterns on her and she usually wears them..i think she does at least 🙂 i really dont mind..if my sister doesnt wear what i knit because i enjoy the process..the truth is i rarely wear what i knit..a shame really but after sinking a month or what not into a project i really dont want to look at it again..i still havent liked a single scarf ive ever knit and am still on the search for the perfect pattern that i will like..im going to knit a couple hats this fall which im hoping to wear and not have them sit in a pile..i did like this post..i like reading what people are doing in their lives in places that are not where i live or otherwise..it cant all be about knitting all the time 🙂 ah i love this lot of yarn…(maybe not the rowan so much..not a navy blue person..)so nice! i wonder if ill win something this time around..thanks! I have totally tried to get Steve to knit too! He has made it as far as casting on but that’s it. I would be wicked offended if I made something for someone and they didn’t wear it. No graphic novels for me, and the oddest DVD in my collection is the Adventures of Baron Munchausen. I was like Lorraine for a long time – I didn’t wear anything I knit. In the past couple of years, I’ve made things I actually want to wear. It’s a relief…and yet I don’t mind not wearing what I knit, nor do I mind when other people don’t wear what I knit. Weird, when I think about it. Mr. Trask is wicked perceptive! England is getting quite the pair with you two. I know they’ll appreciate it and treat you both lovingly. Did I ever tell you that my favorite shade of blue is “Different”? The idea just came out of nowhere that I ought to tell you that. Hmmmm? I would be hurt if I knit something for someone and they wouldn’t wear it. Which is why I have yet to knit for my husband, he is VERY particular when it come to clothes (I also suspect he thinks rainbow socks and inka ponchos when he hears hand-knit). I might try and make him a simple watch cap and we can take it from there. Also loooove the purple Fyberspates! Purple is my favorite winter color. I believe I’ve met Mr. Trask once or twice. As I remember, he seemed somewhat quite (although I’m guessing he was probably surrounding by gaggles of gossiping women fueled by WAY too much coffee), but had a glint in his eye, like there was a joke that only he knew about. I also remember that I could tell immediately how perfect a couple you two made! As for the questions, I have a closet shelf devoted to finished knitting projects that I seem to be stockpiling. Much like cooking, by the time I’m done with something, I’ve lost any interest in wearing it. I’m trying to remedy that now though – I finally wore a lacy scarf that I made out of some incredibly soft kelly green bamboo yarn. I received a ton of compliments and plenty of people who asked if I sold my stuff. I’ve given away a few different baby blankets and such – I have no idea whether they’re used or not and don’t particularly care. However, my greatest knitting aspiration is to make “the” blanket for some kid. You know, the one that they sleep with, take with them to the grocery store, trail through the playground dirt. That would be awesome! My first ever knitting project was a scarf for my dad – it was made out of cheap yarn and was varying widths (not on purpose) with random holes in the middle. While he never wears it, I’ve been told he still has it in his sock drawer. I’ve never read a graphic novel. My DVD collection is minimal (actually, sitting here writing this, it appears to be a total of about 15 discs) – nothing too exciting. Congrats once again for getting into the school program and moving to England! I can only imagine what an experience it will be!!! Aww heck, I meant quiet, not quite…..d’oh!! You guys are all so great. Gwendolyn, how did you get Steve to try casting on? I can barely get Mr. Trask to pet yarn! You know it really didn’t take a ton of effort. When I was learning to knit he was super supportive, suggesting I call his mom or Skype with her. He loved the idea that I was creating something, and often suggested how maybe he should learn. Then one day when I was casting one he decided to “be cool” and try it. I think we started with the wrong type of CO because he spent half the time confused. After about 30 mins of practicing he got it down, and then, was done. He said he would learn the first stitch “another day”. More than a month later he picked up needles again and said he’d forgotten how to cast on, and that has been the end so far. I knit the most for my mom because she appreciates hand-knits and wears them! Mostly shawls and she’s often cold which if you’re matching projects to recipients equals a slam dunk. It’s lovely to read about your other half. For whom have I knit the most? It started out with scarves..thick wool,quick knit. Then fingerless gloves,the fetching pattern. Much easier to knit 24 of them. This year ,it’s going to be felted oven mitts. Just singles for now. Let me interrupt for a moment…BAD DOG! Just ripped a gaping hole in my project bag to get at my knitting and not at a seam! Same dog that chews knitting needles even Signatures!…I thought my collection of DVD’s had some rather obscure ones but when I checked I only found Shaun Et Les Zombies and Le Conte du Monte Cristo. I guess my husband took all the others. I think I need Barbara Woodhouse’s “No Bad Dogs”. Time for wine and some old Red Dwarf or Chef episodes. Chef! Such a great show. Everyone go watch Chef! The first sweater I ever made was for my 6’2″ husband. Now I know why people start with baby sweaters! I almost despaired ever getting it done, but I did, and he did wear it last winter. (check Ravelry for photos). I knit a lot for other people, but I guess I have knit the most for my husband. Two hats, two scarves, and a sweater. Not bad for a year of knitting! The oddest DVD I have in my collection is one I bought for said husband. It’s the BBC “Singing Detective” with Michael Gambon and it is just downright weird. But my husband loves it so I bought it for him for Christmas. When he watches it I watch him and try to figure out what he likes about it. BTW, have a wonderful adventure in England! Oddest DVD owned? My Neighbor Totoro- wonderful anime. Who do I knit for the most – my sons & sisters. Don’t know if t sisters wear what I’ve made but my sons do. Love the story of you & Mr Trask. You are going to have such a wonderful adventure! Enjoy! Love the Fyberspates – great color. I love reading your blog, it’s a lovely deversion from my work. So far, I’ve knit afghans and baby blankets for others. I knit a large afghan for my son to take to college. He said it kept him toasty warm. I felt that he wasn’t so far away, that I was closer to him when he used it. I’m working on market bags as gifts now. I have a fabulous husband, also! He’s also always HOT, so I don’t see knitting him anything anytime soon. If I knit him a sweater EXACTLY like a sweatshirt, he MIGHT wear it someday, but probably not. I waited and WAITED for the DVD of A Midwinter’s Tale to finally be released. It’s one of my fave movies ever, yet was only available on VHS for years. Honestly, BLACKULA was on DVD the minute they came up with the format! Sheesh. Have big fun in Wodehouse land! I knit mostly for my nephews when they were younger. Yes, they did wear the items. I remember making them matching sweaters with dinosaurs on the front and they were well received. When they grew up I then made things for my babies and other peoples babies. I think when you’re short of time the satisfaction of seeing little garments grow quickly is a boost to getting on. (I did make a fairisle sweater for my husband which he never wore – too big and bulky, I didn’t mind though. It was an achievement for me). Hmm… difficult questions… I crochet as well as knit, so I am going to include that in my answers. I have made the most stuff to give to parents who are having newborn babies. I think they do use them unless something is too small. I don’t think about it too much, but sometimes I do wonder what happens to the things I hake once the babies have outgrown them… I hope they are not just thrown out. This post was interesting for me. I like learning about other people’s lives. I have not ever read a graphic novel, and to tell you the truth I avoid them at all costs (no offense intended to those who enjoy them. There is nothing wrong with graphic novels, I just don’t like them personally). The oddest DVD in my collection is an animated film that I bought at a second hand store not knowing that there was supposed to be two DVDs but one was missing. I ended up with only the storyboards for the entire movie. Fun that you brought up graphic novels! I started a few years ago with Watchmen (as many people did, I suspect), and have recently moved on to the Sandman series. Neil Gaiman is one of my favorite authors for novels, so I thought it would be best to read his graphic novels as well, and I’m enjoying them so far. Any other suggestions? Apart from myself, I’ve knit most for my mom, because she doesn’t have the time or sight to knit anything herself. I guess, this is a kind of a repayment for all the sweaters she knit for me when I was little:) I’ve got no problems with sizing, as I’ve only knit her scarves or socks, so she wears everything. I think I would mind somewhat if she didn’t, because of the time put into the knitting. I loved this post, it made me laugh. Yes, I’ve read a graphic novel, and more than one. I’m a secret comic geek:) I read manga too. The oddest DVD, hmm… I think it’s a Chinese release Spider-man 2 movie that I’ve bought second-hand. It’s in English, only with Chinese subtitles. I knit mostly for random children, because they like fun and colorful things. I have not yet knit anything for my fiance. I owe him a hat, but black bores me and he refuses purple. I must get to it soon though…. I keep trying to knit enough things that I can sell some (the ultimate goal being that I could sell knitted FO’s and then buy yarn with that money)… but my kids, nieces, nephews, husbands, parents, in-laws and friends keep having birthdays and whatnot – so I continue knitting furiously for them and honestly am quite happy doing so. I have to admit, I am most happy when I see people actually wearing what they’ve been given – but I try to detach myself as soon as I’ve given something away. I knit mostly for babies as they are always grateful and wear them – as opposed to husbands who leave them hanging in the closet!! Was great to hear about Mr Trask. Very interesting! 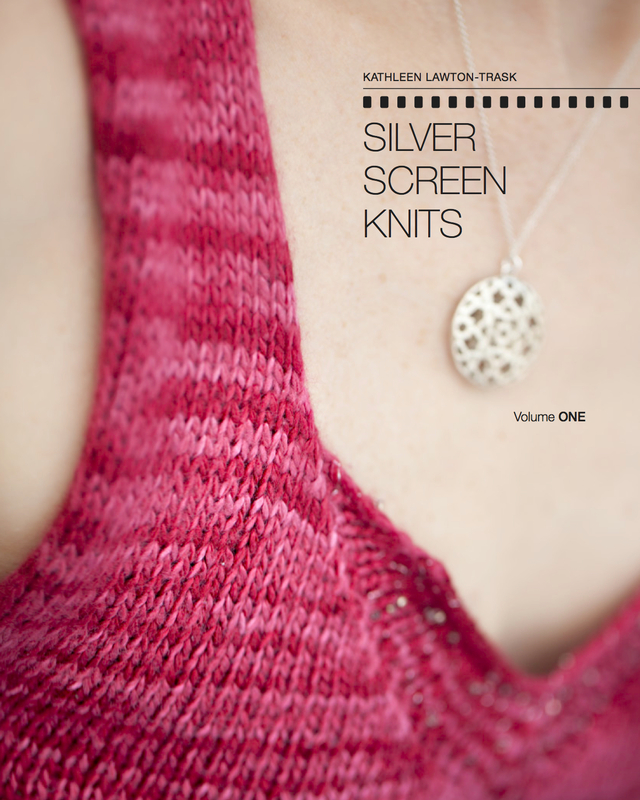 I’ve knit the most for myself and the second-most for my mom – she generally wears things. I don’t mind much either way for things I offered, but if people have requested things it does bother me a bit if they don’t use them. I have knit mostly for my son. I started even before he was born and have been knitting for him ever since. Does he wear what I knit? Well, he doesn’t have a choice. Yet. About graphic novels, I happen to read one once but I do not remember it and I do not own DVDs. I just do not watch television and like to go to movies and theaters though. THank you for your beautiful yarn. Ummm… I spread the knitting love around, but many things have gone to my daughter, now nearly nine. And after my initial scarf phase (knitting one for mom, dad, sister, multiple friends, daughter, etc.) and many cowls for others, I finally have many projects going that are for me…Although I did tell said daughter that I’d share this particular lace cowl with her, since it’s a yummy raspberry & orange sorbet color mix. I’ve never really ready graphic novels, but daughter loves The Babysitter’s Club (in graphic novel form), plus others that are similar to Japanese anime. Loved “getting to know” Mr. Trask; you two are embarking on a wonderful new adventure together. And I, too, am fond of the Fyberspates. Love the purple of that scrummy Fibrespates, and that Rowan Tapestry looks gorgeous. I’m intrigued by the soy silk. I love the Rowan Tapestry. For whom have you knit the most? My friends. There is no one in particular I frequently knit for, but they seem to like my knitted cacti. Do they wear what you knit? I hope not since they would look silly with a plant pot on their head. Hehe. Do you mind, one way or the other? No, as long they bring out the knitted gifts when I come to visit. Was this post in any way interesting, or would it be better with some actual knitting content (for goodness’ sake)? I thought it very good. :-). I enjoyed it. I had some knitting in it (well the word). Have you ever read a graphic novel? Yes I have. I have read a Judge Dredd one and a Babylon 5 few. I used to get 2000 AD. And what’s the oddest DVD in your collection? Eerie Indiana. The best spooky kids series that was cancelled. Knitted cacti! I love it! Do you have photos? For the first 6 years or so of getting back into knitting (starting in 2000), I knit for others. Mostly volunteer efforts. Now I knit for me AND others. The couple of sweaters I made for myself wound up not fitting (I lost weight before I was ready to wear them) so the things I’ve made and worn for myself are scarves, mittens, and socks. Lots of socks. I love socks. The things I’ve made for others are scarves, mittens, sock, baby clothes, hats (lots and lots of hats…this is Minnesnowta, afterall), sweaters, a jacket for my mom, slippers, fingerless mittens and who knows what else. This is the first time I’ve visited your blog and I really enjoy your style of writing. Very easy flow, keep up exactly what you’re doing. Works for me. Oddest DVD – well, I only own one and that’s Labyrinth and I’ve seen the movie nearly 4 dozen times since the late 80’s when my first copy of it was on VHS. I know, I know, who has those anymore? 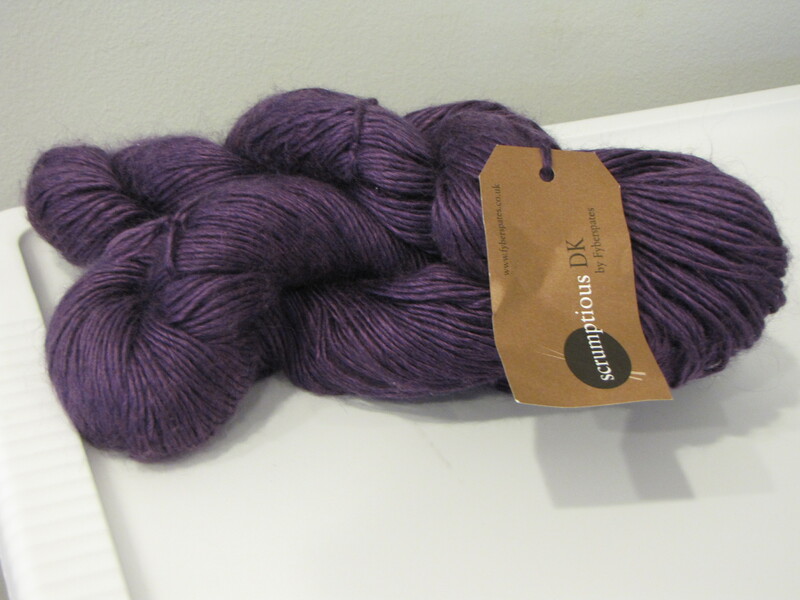 If I had my druthers about the yarn you’re giving away I would have to say that the Harrisville Designs Highland Tweed would be my first choice BUT the Fyberspates Scrumptious DK would be a delicious addition to my oh-so-lacking-purple-yarn stash. No, really. I need purple, my boyfriend would love it. ah nuts, I see I’m too late for this one. Never mind! But I see you’re moving to Oxford! I lived there for 2 years. Feel free to email me if you have any questions (I was doing a Master’s at the University).